Lautze, N.C., Thomas, D.M., Hinz, N., Ito, G., Frazer, N., and Waller, D., 2017. Play Fairway Analysis of Geothermal Resources across the State of Hawaii: 1. Geological, geophysical, and geochemical datasets, Geothermics 70: 376-392, doi: 10.1016/j.geothermics.2017.02.001. Ito, G., Frazer, N., Lautze, N.C., Thomas, D.M., Hinz, N., Waller, D., Whittier, R., and Wallin, E., 2017. Play Fairway Analysis of Geothermal Resources across the State of Hawaii: 2. Resource Probability Mapping, Geothermics 70: 393-405, doi: 10.1016/j.geothermics.2016.11.004. Lautze, N.C., Thomas, D.M., Waller, D., Hinz, N., Frazer, N., and Ito, G., 2017. Play Fairway Analysis of Geothermal Resources across the State of Hawaii: 3. Use of Development Viability as one criteria to prioritize future exploration activities. Geothermics 70: 406-413, doi: 10.1016/j.geothermics.2017.07.005. Lautze, N.C., and Thomas, D.M., 2019. Update to the Hawaii Play Fairway Project, Now in Phase 3. Proceedings, Stanford Geothermal Workshop, Stanford University. Lautze, N.C., Thomas, D.M., Ito, G., Frazer, N., Martel, S., Hinz, N., and Whittier, R., 2018. Review of the Hawaii Play Fairway Phase 2 Activities. Proceedings, 43rd Workshop on Geothermal Reservoir Engineering, Stanford University, SGP-TR-213, 9 pp. Lautze, N.C., Thomas, D.M., Whittier, R., Martel, S., Ito, G., Frazer, N., Hill, G., Martin, T., Wannamaker, P., and Hinz, N., 2017. Improving a 2015 Map of Geothermal Resource Probability Across the State of Hawaii. Proceedings, 42nd Workshop on Geothermal Reservoir Engineering, Stanford University, SGP-TR-212, 8 pp. Lautze, N.C., Thomas, D., Hinz, N., Ito, G., Frazer, N., and Waller, D., 2016. Hawaii Play Fairway Analysis: Discussion of Phase 1 Results. Proceedings, 41st Workshop on Geothermal Reservoir Engineering, Stanford University, SGP-TR-209, 7 pp. Lautze, N.C., Thomas, D.M., Hinz, N., Frazer, N., Ito, G., Faulds, J., and Brady, M., 2015. Play Fairway Analysis of Geothermal Potential in the State of Hawaii. Proceedings, Near-Surface Asia Pacific Conference, Society of Exploration Geophysicists, p. 162-164, doi: 10.1190/nsapc2015-043. Lautze, N.C., Thomas, D.M., Hinz, N., Frazer, N., Ito, G., Waller, D., Schuchmann, H., and Brady, M., 2015, Integration of Data in a Play Fairway Analysis of Geothermal Potential Across the State of Hawaii. Geothermal Resources Council Transactions, v. 39, p. 733‑737. Tachera, D.K., 2018. A Hydrogeochemical Analysis of Geothermal Resources in the State of Hawaii. Master of Science Thesis (Plan B), Department of Geology and Geophysics, University of Hawaii at Manoa. Waller, D.G., 2016. Identification of Geothermal Resources in Hawaii Utilizing Aqueous Geochemistry. 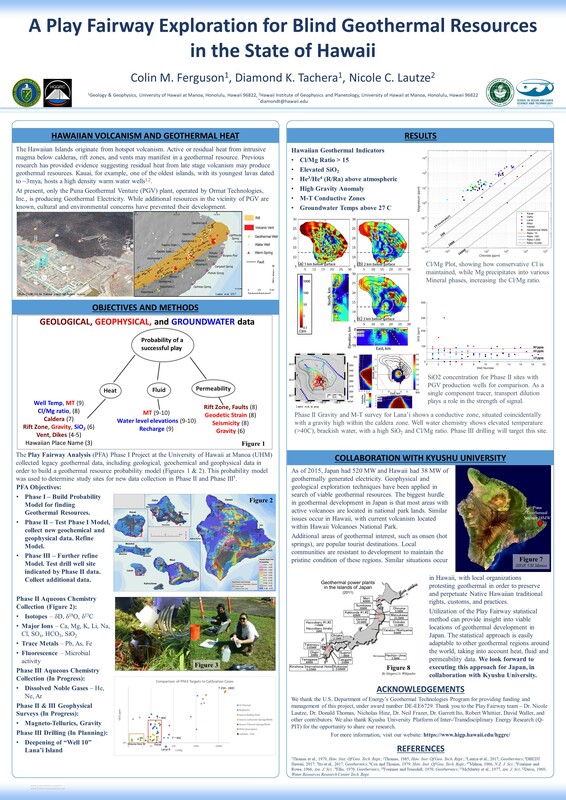 MGeo Project Report, Department of Geology and Geophysics, University of Hawaii at Manoa. Lautze, N.C., and Thomas, D.M., 2019. Update to the Hawaii Play Fairway Project, Now in Phase 3. Proceedings, Stanford Geothermal Workshop, Stanford University, Palo Alto, CA. Ferguson, C.M., Tachera, D.K., and Lautze, N.C., 2019. A Play Fairway Exploration for Blind Geothermal Resources in the State of Hawaii, Q-PIT Annual Symposium, Kyushu University, Fukuoka, Japan. Lautze, N.C., 2019. Hawaii Play Fairway Project. Invited presentation at Energy Week 2019, Q-PIT Annual Symposium, Kyushu University, Fukuoka, Japan. Lautze, N.C., and Thomas, D.M., 2018. Overview of a New Geothermal Resource Assessment for the State of Hawaii. Cities on Volcanoes 10, Napoli, Italy. Lautze, N.C., Thomas, D.M., Ito, G., Martel, S., Hinz, N., Frazer, N., and Whitter, R., 2018. Review of the Hawaii Play Fairway Project Phase 2 Activities, Stanford Geothermal Workshop, Palo Alto, CA . Tachera, D.K., and Lautze, N.C., 2018. A Hydrogeochemical Assessment of Geothermal Resources in the State of Hawaii, Kyushu University Platform of Inter/Transdisciplinary Energy Research (Q-PIT), Fukuoka, Japan [G-8]. Lautze, N.C., 2018. Hawaii Play Fairway Project. Invited presentation at Energy Week 2018, Q-PIT Annual Symposium, Kyushu University, Fukuoka, Japan. Lautze, N.C., 2017. An Overview of the Hawaii Play Fairway Project. Invited presentation at Abstracts with Programs, GSA Annual Meeting, Geological Society of America, Seattle, WA (Vol. 49, No. 6. doi: 10.1130/abs/2017AM-306980). Frazer, N., Ito, G., Lautze, N.C., Thomas, D.M., Hinz, N.H., and Whittier, R., 2017. Two Simple Methods in Geothermal Reconnaissance: The Voter-Veto-Confidence Method and the Back-Propagation of the Advected Geochemical Signals; Abstracts with Programs, Cordilleran Section – 113th Annual Meeting – 2017, Geological Society of America, Honolulu, HI (Vol. 49, No. 4, doi: 10.1130/abs/2017CD-293007). Tachera, D.K., Lautze ,N.C., Thomas D.M., and Whittier, R., 2017. A Geothermal resource assessment for the State of Hawaii using Hydrogeochemical Analysis; Abstracts with Programs, Cordilleran Section – 113th Annual Meeting – 2017, Geological Society of America, Honolulu, HI (Vol. 49, No. 4, doi: 10.1130/abs/2017CD-292431). Thomas, D.M., and Lautze, N.C., 2017. Geothermal Energy in Hawaii: A Historical Perspective; Abstracts with Programs, Cordilleran Section – 113th Annual Meeting – 2017, Geological Society of America, Honolulu, HI (Vol. 49, No. 4, doi: 10.1130/abs/2017CD-292707). Lautze, N.C., Thomas, D.M., Whittier, R., Martel, S., Ito, G., Frazer, N., Hill, G., Martin, T., Wannamaker, P., and Hinz, N., 2017. Improving a 2015 Map of Geothermal Resource Probability Across the State of Hawaii. Stanford Geothermal Workshop, Palo Alto, CA. Lautze, N.C., Thomas, D.M., Hinz, N., Ito, G., Frazer, N., and Waller, D., 2016. Hawaii Play Fairway Analysis: Discussion of Phase 1 Results. Stanford Geothermal Workshop, Palo Alto, CA. Lautze, N.C., Thomas, D.M., Hinz, N., Frazer, N., Ito, G., and Waller, D., 2015. Integrating Geologic, Geochemical and Geophysical Data in a Statistical Analysis of Geothermal Resource Probability across the State of Hawaii, AGU Fall Meeting, San Francisco, CA (H23A-1561). Lautze, N.C., Thomas, D.M., Hinz, N., Frazer, N., Ito, G., Waller, D., Schuchmann, H., and Brady, M., 2015. Integration of Data in a Play Fairway Analysis of Geothermal Potential Across the State of Hawaii ; Geothermal Resource Council. (oral and poster) Reno, NV. Lautze, N.C., Thomas, D.M., Frazer, N., Ito, G., Hinz, N., Brady, M., and Faulds, J., 2015. Play Fairway Analysis of Geothermal Potential in the State of Hawaii; Society of Exploration Geophysics Near Surface Asia Pacific Conference. (oral) Waikaloa, HI, doi: 10.1190/nsapc2015-043. Lautze, N.C., 2015. Play Fairway Analysis of Geothermal Potential across the State of Hawaii; DOE Geothermal Technologies Office Peer Review. Westminster, CO.
Lautze, N.C., Calvin, W., Moore, J., Haskins, E., and Thomas, D.M., 2014. Study of Hydrothermal Mineralization in 2013 Drill Core from Hawaii Island. AGU Fall Meeting, San Francisco, CA (H43A-0953). Lautze, N.C., Thomas, D.M., Hinz, N., Frazer, N., Ito, G., Brady, M., and Faulds, J., 2014. Comprehensive analysis of Hawaii’s geothermal potential through Play Fairway integration of geophysical, geo-chemical, & geological data, Geothermal Resource Council General Assembly, Portland, OR.